This product is a snowflake shape wrench tool with 19 functions, only 60g, you can hang it on your keychain, it will be a good decoration and also a good helper for you. 19-in-1 stainless multi-tool with snowflake shape. Available for: flathead screwdriver, #3 and #2 phillips screwdriver, 4mm, 5mm and 6mm allen wrench, box cutter, bottle opener, 1/4in, 7/16in, end wrench 5,6,7, 8, 10, 12, 13 and 14mm end wrench, and key hole. Only 2.1 ounces (60g) and just over 2.4" in diameter. 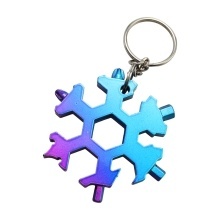 Unique snowflake shaped design, perfect to attach to keychains or backpacks.